My partner and I had rather enjoyed District 9 when it first came out. It was such a striking way of tackling some pretty major political concepts, but all wrapped up in a pretty interesting variety of classic science fiction ideas presented in a manner that was both austere and yet also unique. And so I now that a lot of geeks were looking forward to Elysium, the first Neill Blomkamp since District 9. I didn't know much about it apart from the major promotional images that presented Matt Damon in his exoskeleton outfit and related shots of him in action. There was also mention of Jodie Foster a lot, but then her movie career has been a little weird in recent years. Thus her involvement didn't exactly excite me all that much. The follow-up movie after your big critical success is always a tricky venture. Comparisons will always be there and at times it probably feels like the world is watching to see whether or not it will fail. And thus the potential for disappointment may somehow add to the overall level of expectation as well. 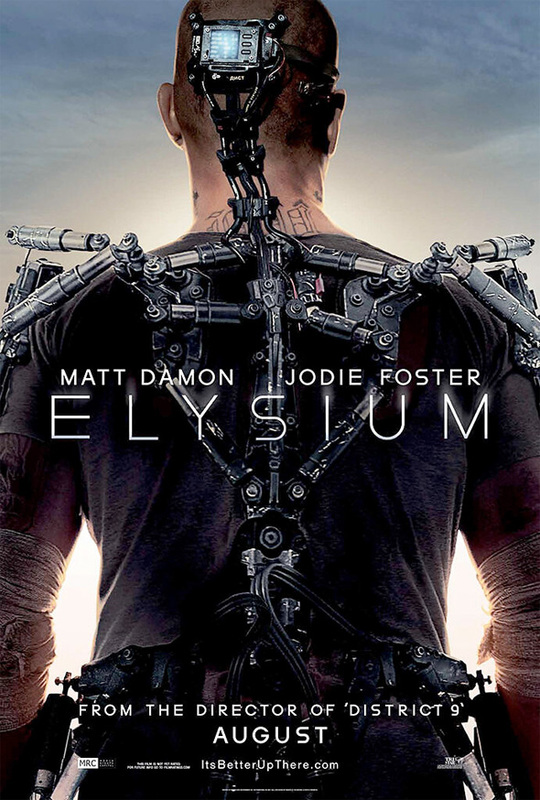 Synopsis: Elysium is a 2013 science fiction movie written, directed and co-produced by Neill Blomkamp. It had a production budget of $115 million, which is practically 4 times of the budget for District 9, just to put things in perspective. In some future period, we find that Earth has more or less been divided into two major factions. You have the poorer folks stuck on Earth with most citizens tagged as being undesirable for one reason or another. And most if not all see to be living in a state of poverty with limited access to more advanced technology. Then there's an elite group living on a habitat in space known as Elysium which is the height of luxury. Their citizens practically live without a care in the world since they are fully supported by the government with wondrous technologies like these special med-bay pods that cure almost any human ailment). Enter Max Da Costa (Matt Damon), petty criminal who is on parole in Los Angeles and works as a factory worker at Armadyne Corp. A workplace accident results in him receiving a lethal dose of radiation and it appears that he'll only have 5 days to live. Thus he seeks out help to find a way to smuggle himself onto Elysium with fake identification that will establish he's a citizen of Elysium and thus eligible for treatment. But that somehow entangles him into a larger plot involving the Elysium Secretary of Defense Delacourt (Jodie Foster) trying to take control of the habitat. Like District 9 before it, Elysium certainly tried to tackle some larger conventional issues using science fiction as medium. It's not a new concept in itself - many past science fiction stories have been allegories for modern day issues. But in this case, Blomkamp seems pretty focused on telling these sorts of stories. And he has a particular dystopian view that is beginning to dominate his movie ideas to a certain degree. It seems almost unfair to start to identify tropes based on two movies and a short film that I've watched, but the fact that they all share so many common ideas, it really puts forward the notion that he's a bit of a one-trick pony. We have people living in relative poverty despite the existence in the world of higher technology. We have the added element of robots being somewhat prevalent in the world (previously it was alien power armor). And there's a weird mix of accents as a cherry on top. The central conflict here is the classic haves versus have-nots sort of story. There's the general problem of all the people on Earth who are still suffering from various diseases and are denied access to the near-magical technology on Elysium. Then we bring it down to the level of Max who also needs treatment and some other random kid who has leukemia. That's laying it on a little thick, but what can we do. And I think it would have been okay had the whole narrative flow not been so disjoint. Things didn't go very well from segment to segment with a lot of bits that didn't make sense, but we still just had to go with it. Given the focus on the importance of the medical technology on Elysium and the fact that the habitat was dependent on Earth for supplies and manufacturing, you'd think that someone would try to attack any on-planet production facilities that were responsible for creating the medical bays to begin with. The intrigue on Elysium wasn't all that compelling either and Jodie Foster (with moments in French) just didn't come across as this powerfully savvy political operator or something. Sharlto Copley, who played the lead in District 9, has gone from lanky scientist to rather ripped lethal military agent. I didn't quite understand why he absolutely had to be involved in this movie, but then I guess Blomkamp thought he had reached his point in his career. Elysium had some lofty goals and some interesting ideas, but at the end it just didn't deliver things all that well. Add in Matt Damon just being Matt Damon and it really didn't quite have the impact that it probably hoped for. Thus the movie really only gets 2.5 All-powerful robot warriors out of a possible 5.